Past statements from al‐Qa’ida Central, as well as their franchise groups, highlight the importance of targeting the U.S. economy as part of their strategy of confronting the West. Most recently, militant propagandists, such as Adam Gadahn, American mouthpiece for Al‐Qa’ida in Pakistan, have made statements advising Muslims in the West to “…undermine the West’s already struggling economies with…targeted attacks on symbols of capitalism which will shake consumer confidence and stifle spending”. Additionally, in November 2010, al‐Qa’ida in the Arabian Peninsula introduced the “strategy of a thousand cuts”, where they encouraged their mujahideen brothers to “attack the enemy with smaller, but more frequent operations…the aim is to bleed the enemy to death”. In December 2010, Abu Suleiman al‐Nasser, a prominent member of the Shumukh al‐Islam [Arabic] forum, advised that the U.S. economy is at its weakest and he called on the “Mujahideen Brigades” to attack the “soft underbelly of the enemies”. 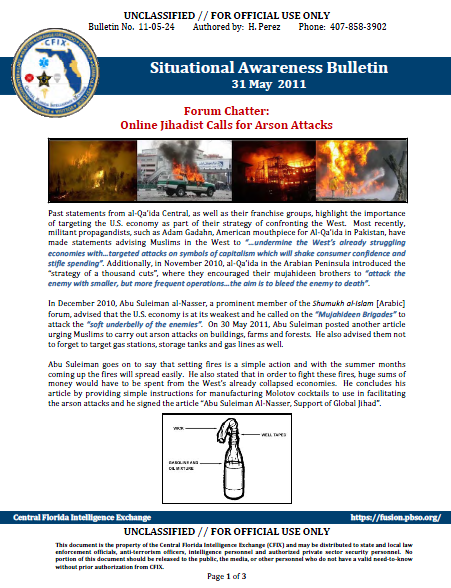 On 30 May 2011, Abu Suleiman posted another article urging Muslims to carry out arson attacks on buildings, farms and forests. He also advised them not to forget to target gas stations, storage tanks and gas lines as well. Abu Suleiman goes on to say that setting fires is a simple action and with the summer months coming up the fires will spread easily. He also stated that in order to fight these fires, huge sums of money would have to be spent from the West’s already collapsed economies. He concludes his article by providing simple instructions for manufacturing Molotov cocktails to use in facilitating the arson attacks and he signed the article “Abu Suleiman Al‐Nasser, Support of Global Jihad”. Arsons have the potential to become an appealing tactic for extremists groups and individuals seeking to carry out attacks that would have a major impact on the economy, as well as, furthering their global agenda and long‐term strategic objectives. This type of attack is simple to perform, has relatively no cost and is a very low security risk, but at the same time yields large scale destruction and frequently draws media attention. As “would be” jihadists, online and in the real world, continue to share potential methods of attack and “lessons learned” with other like‐minded individuals, it will likely become increasingly more difficult for law enforcement and members of the intelligence community to identify those individuals who are who may be in the pre‐operational phase of an attack. Because of the perceived randomness and simplicity of carrying out this type of attack, it could be appealing to those who are inspired by al‐Qa’ida’s ideologies and desire to fulfill their obligation of “individual jihad”.